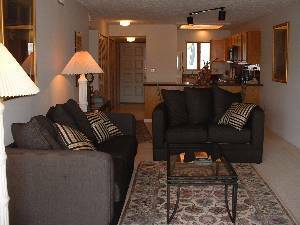 bath condominium in Pigeon Forge, Tennessee. to popular attractions, it is very quiet and secluded. The master bathroom was fully remodeled in 2008. Less than one mile from Dollywood and Dolly's Splash Country. About one hour's drive from Neyland Stadium and the University of Tennessee. 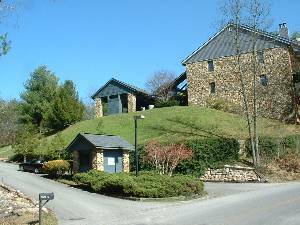 Quiet, private condominium community, less than 1/2 mile from the parkway. 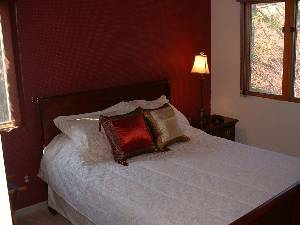 Spacious master bedroom with jacuzzi and upgraded TV/DVD. Queen-sized second bedroom, separated from master bedroom for extra privacy. Excellent space for entertaining or relaxing. Cable TV included. 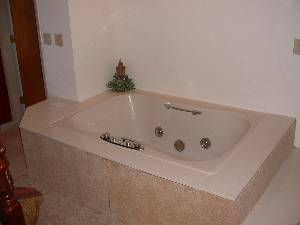 Jacuzzi for two in master bedroom. 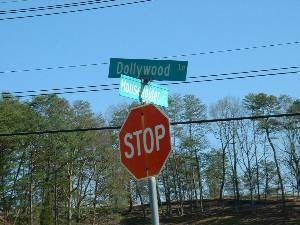 Right on the corner of Dollywood Lane. You can hear the train whistle! This was our first time and we will be back. It was great. Great location and a very nice place to stay. It has everything that you would have at home and more. Thanks so much for letting us stay in your home. Condo was clean, attractive--and very comfortable. It felt like "home, away from home." 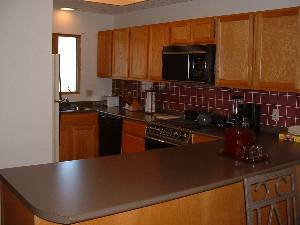 It is located in a quiet neighborhood with a very lovely landscaped lawn. We will diffinitely go back to stay. I dealt with Ed Anderson and he is extremely helpful and very easy to do business with. I would recommend this condo over any other place we've stayed in at Pigeon Forge. What a nice place. It was great and very clean. Couldn't ask for anything more. Thanks so much. Beautiful place. Great location. When I go back to the Pigeon Forge / Gatlinburg area, I will stay here again. We visit the Smokey's a couple of times each year. What a relief to have the availability of this condo. It's clean, comfortable and quiet. It's our home away from home in the mountains. It's also very easy to work with the owners. My family and I love the mountains. The biggest issue we have had in the past is finding a place that every one can agree with. We have found it in this place, perfect place,perfect location and great people to deal with. Thank you for a great experience!!!!!!! This was our first experience staying in a condo, rather than a hotel. This condo was great! It was very clean and was beautifully decorated. Very easy access to everything. It was nice to clean clothes before we left so that I didn't have to do it when we got home. We aren't used to having a little privacy away from the kids on vacation so having 2 bedrooms was very nice as well. We received our deposit back within just a week after checking out. We will definitely recommend this place to our family and friends visiting the Pigeon Forge area. Very comfortable, a home away from home. Will be repeat renters. "AAA+++Beautiful Condo and prompt refund on deposit!! Thanks alot!" -Randall D., Nashville, TN. "Great Place to Stay in the Smokies!! Highly Recommend!!!" -Heath F., Greeneville, SC. "Smooth transaction, excellent condo as pictured, highly recommend!" 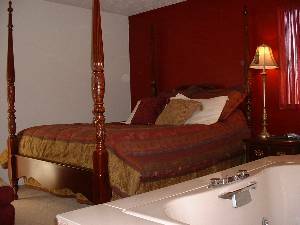 -Angie L., Crofton, KY.
"Great deal and nice place- had a great time! Highly recommended!" -Curtis B., Hamilton, OH. Pay for 6 nights, get the 7th free. Return customers get 5% discount on any rate. Deposit: Dates are held upon receipt of payment]. Credit cards are accepted through ...com. The following Holidays require a minimum three night stay: New Year's Day, MLK Day, Valentine's/Presidents' Day, Easter, Memorial Day, Independence Day, Labor Day, Thanksgiving, Christmas. Cancellations and Refunds: If reservation is canceled more than 14 days in advance, all fees refunded, less $ 25.00 administrative fee. If reservation canceled 7-14 days in advance, 75% of deposit refunded. If reservation canceled less than 7 days in advance, 50% of deposit refunded. Other Fees: The cleaning fee is per stay, not per day. Required Stay: Minimum two night stay.